The Dolce & Gabbana Powder Brush is crafted from high-quality AAA-grade goat hair and its stem features elegant engraved gold lettering. 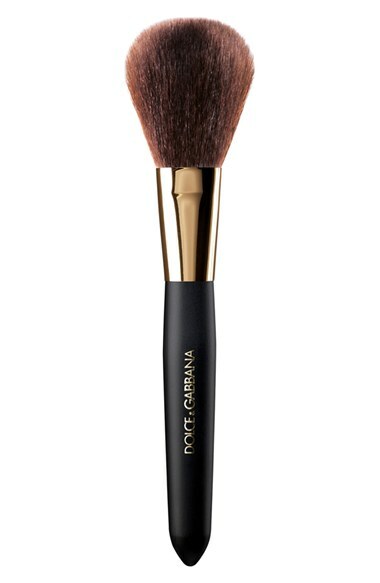 You rarely see this out in the beauty-sphere, but the Italian luxury house Dolce & Gabbana has come out with a line of brushes that it says are made with AAA-grade goat hair. While it may be common for such disclosures in Japan, that’s not usually the case here in the U.S., but we’re delighted to see it! The brushes are available at Nordstrom, where the AAA-grade rating appears in the marketing materials, as well as Saks, where it does not. This AAA-grade goat hair grouping of brushes from Dolce includes six brushes: a powder brush, blush brush, pencil brush, eyeshading brush and two blending brushes. I’ll be buying these brushes pronto, and will report back on them soon! Disabled by a Dirty Makeup Brush! Seriously!